Gore Vidal wrote this as a television play in which form it debuted on May 8, 1955 on Goodyear Television Playhouse. Later he reworked it for the Broadway stage, where it debuted on February 7, 1957 and ran for 388 performances. Star Cyril Ritchard, who also directed, received a Tony Award nomination for his performance as Kreton. Eddie Mayehoff also received a nomination for Best Performance by a Featured Actor. Before playing on Broadway the play was performed at the Shubert Theatre in New Haven, Connecticut January 16–19, 1957. Starring Cyril Ritchard and Eddie Mayehoff. Vidal intended the play as a satire on the post-World War II fear of communism in the United States, McCarthyism, Cold War military paranoia and the rising importance of television in American life. A major critical success, it was subtitled A Comedy Akin to Vaudeville. The play tells the story of Kreton, an alien from an unnamed planet who lands on Earth intending to view the American Civil War. He miscalculates and lands instead 100 years later. Having missed the opportunity to see conflict first hand, but delighted with all the new playthings the 20th century has invented for war-making, he decides to create a war for himself. I saw, and enormously enjoyed, a traveling company performance of the show in Berks County PA in the early 1960s. 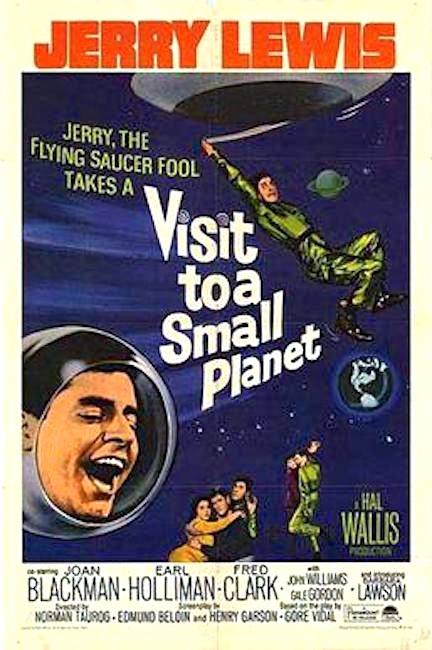 As told by the New York News, Visit to a Small Planet” is an imaginative affair in which an alien comes from another planet to do a bit of sightseeing and to see or start a war. He thinks he has arrived in time to see the Civil War, which he expects will be jolly, but he has misjudged his landing and gets here in 1957. He tries to make the best of it. ‘Isn’t hydrogen fun?’ he gurgles, as he hears about modern warfare. Where he comes from, civilization has gone way beyond what we have here. They don’t have babies anymore, for instance, he explains to us earthlings, ‘We gave it up. Sometimes I think we were a bit hasty.’ This interplanetary visitor, who can read human minds, and even have an enchanting conversation with a Siamese cat, plops himself into an average community whose population includes an average general, an average boy and girl in love, and an average TV newscaster or oracle and an above-average cat.” Since he has missed the Civil War, the visitor from outer space (not from Mars, he insists) decides to make his own war — he’s enchanted with all the new playthings the twentieth century has invented for war-making, and he wants to toss a few of them around. Since on his planet emotions withered away to make room for intellectual development, he sees no reason why a few people shouldn’t be happy to die for his amusement; and it takes the combined action of the entire cast to persuade him to call off his war. 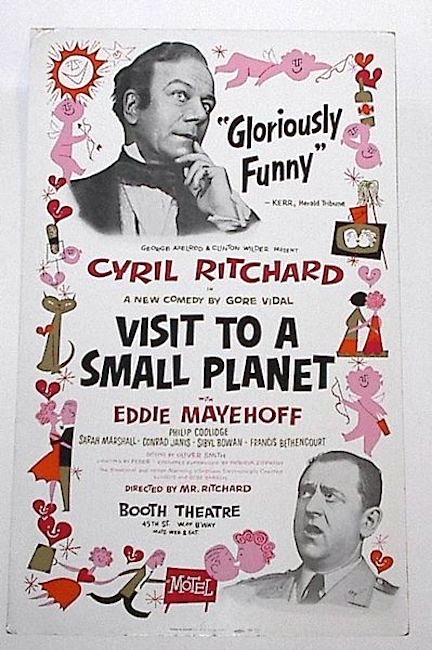 Cyril Joseph Trimnell-Ritchard [accent on the second syllable of Ritchard] (1 December 1898 – 18 December 1977), known professionally as Cyril Ritchard, was an Australian stage, screen and television actor, and director. He is probably best remembered today for his performance as Captain Hook in the Mary Martin musical production of Peter Pan. In 1945, he played Gabriele Eisenstein in Gay Rosalindaat the Palace theatre in London, a version of Strauss’s Die Fledermausby Erich Wolfgang Korngold in which he appeared with Peter Graves. The show was conducted by Richard Tauber and ran for almost a year. I haven’t seen the movie, and I doubt that I ever will: the idea of Jerry Lewis doing a Cyril Ritchard part is just grotesque. This entry was posted on April 29, 2018 at 4:20 pm and is filed under Actors, Morning names, Movies and tv. You can follow any responses to this entry through the RSS 2.0 feed. You can leave a response, or trackback from your own site.